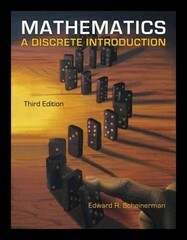 Mathematics 3 Edition Master the fundamentals of discrete mathematics and proof-writing with MATHEMATICS: A DISCRETE INTRODUCTION! With a clear presentation, the mathematics text teaches you not only how to write proofs, but how to think clearly and present cases logically beyond this course. Though it is presented from a mathematician's perspective, you will learn the importance of discrete mathematics in the fields of computer science, engineering, probability, statistics, operations research, and other areas of applied mathematics. Tools such hints and proof templates prepare you to succeed in this course.